The Holy Grail of electric vehicles is a battery that combines long range with short charging times. Toshiba recently announced advances in its SCiB, a Li-ion battery variation, that just might deliver EVs to the promised land. The company claims that its next-generation SCiB will have twice the energy density of current SCiB batteries. 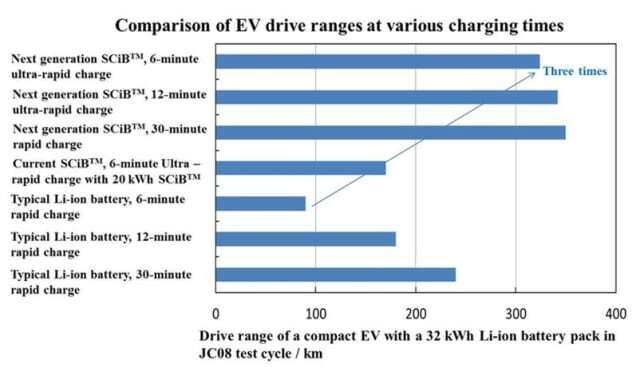 According to Toshiba's press release, a 32 kWh battery could deliver a range of 200 miles (320 km) for a compact car. Energy is the ability to do work, like move a car. Because it's is so valuable, energy is measured in Joules. (Sorry - professor joke.) In the electrical world, however, the kiloWatt-hour (kWh) is a more convenient unit of energy. Power is the rate at which energy is used or delivered; its unit is the Watt. Since power is the rate of energy transfer, we can say that energy represents power over a given time period. Current is the flow of electrons (measured in Amps) and voltage is the force that moves the electrons (measured in Volts). Higher currents require larger wires, so when we get into very high current levels, the wire sizes can become unruly; that's why the electric grid uses high voltages for long-distance transmission of electricity - the grid transports the same power with less current, smaller wires, and fewer losses. A Tesla Supercharger can deliver 120 kW per car at a voltage of 480 Volts. Do a little algebra and we find that the Supercharger is capable of pumping 250 Amps into each vehicle's battery. That's a lot of current! Most residential properties only have a 100 or 200 Amp service, so you won't find a Supercharger in someone's garage. Assuming Toshiba's quick-charger also runs at 480 Volts, the 320 kW charge rate would require a current of 667 Amps. In engineering, everything's a trade-off, and battery charging is no different. Quick charging reduces a battery's life, and the more often it's quick-charged, the sooner the battery will lose its capacity. Is that a big problem? Probably not, since quick charging is only needed on long trips, and most drivers aren't doing that on a regular basis. The majority of EV charging will occur overnight, slowly, using household current and voltage, so the impact on battery life should be minimal. I have no doubt that with advances in battery research, we'll have affordable quick-charging batteries within the next decade. While that's great for individual cars, it's going to present an infrastructure problem as the transportation industry becomes electrified. Imagine a service station at an interstate rest area, where there are a dozen or more fuel pumps operating simultaneously. Now convert those to EV quick-chargers at 320 kW each. Twelve pumps would draw 3.84 megawatts - about the same power consumption as the average US factory. We'll need them at regular intervals on the interstate system, and the design should minimize the impact on the electric grid. So here's the challenge: Would you design the station like a grid-powered factory, so it could handle a continuous 3.84 MW at any given moment and charge the cars directly from utility power? Or would you have on-site storage, like a utility-scale battery bank that's slow-charged from the grid, and charge the cars from the battery bank? How about adding renewable energy? Solar? Wind? What combination? What's the rationale for your choice?